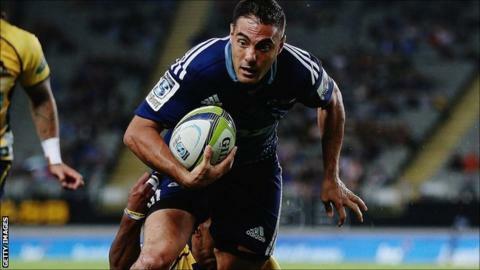 Bath have signed utility back Dan Bowden on a two-and-a-half-year deal. He will arrive at the club in January 2016 and previously played for London Irish and Leicester Tigers before returning to New Zealand in 2014. "He's a good footballer, an intelligent footballer," Bath head coach Mike Ford told BBC Radio Bristol. "We have a little bit of money left in the salary cap and it's an area where we think can be improved and have more rotation. "It's a two-and-a-half-year contract and I think the fans at the Rec will enjoy watching him. "I've got a lot of money left, so we're looking to sign one more in the forwards and in the backs." Bowden himself added: "I know what a tough, entertaining competition the Premiership is, so I can't wait to get back to England and get started with Bath."